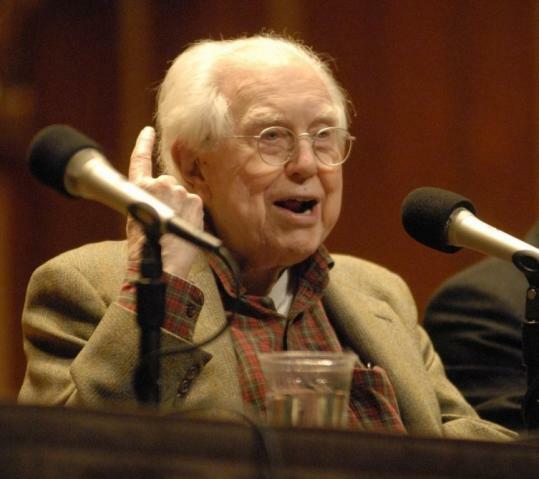 NEW YORK - Sitting in his Greenwich Village apartment, on the verge of his 100th birthday, composer Elliott Carter is looking back fourscore years and a couple of hundred miles northeast: The composer and longtime New Yorker is fielding questions about his six years as a Harvard student in the 1920s and '30s. He jokingly protests: "My head's too full!" As a Sagittarius (element: fire; quality: mutable), Carter has enjoyed nearly a full year of anticipatory celebrations. Last night and tonight, James Levine and the Boston Symphony Orchestra were slated to present another, pairing the premiere performances of Carter's new piano concerto "Interventions" with Stravinsky's "Rite of Spring," the piece that first sparked Carter's interest in modern music. (Tomorrow and Tuesday, "Interventions" will be replaced with Carter's Horn Concerto, which the BSO premiered last season.) Levine and the BSO will then repeat the "Interventions" program at Carnegie Hall on Thursday, Carter's birthday. The connection is apt. "One of the main reasons I went to Harvard was because of the Boston Symphony - because it was, at that time, conducted by [Serge] Koussevitzky, and he played a lot of contemporary music," Carter remembers. "And that was something that was very enticing to me." He became a regular at Symphony Hall. "I sat on the steps, and I would get those rush seats for almost every concert for six years." Nevertheless, Carter ended up earning an undergraduate degree in English. "The thing about Harvard," he says, "the thing I didn't realize, but now it seems perfectly sensible, was that the Harvard music department was primarily, at that time, a place to teach church organists. And that wasn't my style." As a teenager, Carter had already steeped himself in dissonant post-World War I modernism. "When I think about it, I was really rather nutty at that time. I took a rather solid harmony course with Walter Spalding" - for many years, head of Harvard's music department - "and the very first [thing], he gave us all some sort of tune to harmonize; and, well, I harmonized it like Schoenberg. When they saw that, everybody laughed so much, that I decided English literature would be a little safer." Carter encountered now-forgotten Harvard legends, including the notoriously self-confident English professor George Lyman Kittredge. "Kittredge was a tyrant, but wonderful. I remember so well, Sever Hall would be filled with people who were waiting. And he would come in; sit down; and if somebody sneezed, he'd say, 'You get out.' So we were all sitting there terrified." Carter took philosophy courses with Alfred North Whitehead ("he was the big guy at that time"), whose metaphysics of dynamic change contributed to Carter's own musical thinking, and the staunch anti-Romanticist Irving Babbitt. But it was classmates Carter remembers as the important force, "a whole bunch of people who were interested in modern art." They included Lincoln Kirstein, who founded Ballet Caravan (for which Carter was music director for a time) and the New York City Ballet, and Alfred Barr, the first director of the Museum of Modern Art. They "finally got important, and into important places, and did things." Carter expanded his musical horizons outside Harvard Square. In New York, the young Carter had made the acquaintance of the iconoclastic composer Charles Ives; in Cambridge, he found a similar figure. "I discovered, I think on Ellery Street, a rather interesting American composer [who] had been played by the Boston Symphony, Henry Gilbert, and I went around with one of his daughters," Carter says. Gilbert was fascinated by African-American music; his best-known work, "The Dance in Place Congo," a ballet on Creole themes, had been premiered at the Metropolitan Opera in 1918. "He was very much against the music department at Harvard - he wanted folk music, he was very strong for all that. "The Harvard music department always had a fundamental problem," Carter says, "and that is, you get these students who are so intelligent, so cultivated, who know about music, but they have no musical training. That's why I went to study at the Longy School, because I didn't have ear training; and I learned a lot there, that I never would have learned at Harvard." As a student, Carter was largely insulated from the onset of the Great Depression. "I read about it in the paper," he says. "But it didn't seem to have any direct effect on myself, or on Harvard, either. It all went on just like it always had." ("I only hope it's going to be like that this time," he adds.) Prohibition was another story. "We were all making bathtub gin," he admits. Was it any good? "Well, it was pretty hard on the stomach," he laughs. "If not on the brain." The British composer Gustav Holst was a visiting professor. "He was very elderly and somewhat blind, so that we all had to play our pieces for him on the piano. And he complained that I played the piano so badly, because there were so many wrong notes." Were they wrong notes? Carter grins. "Some yes, and some no." Carter returned to Cambridge after his studies in Paris, but times had changed. "It was the high period, the deep Depression, and impossible to get a job." He wrote a "Tarantella" for the Harvard Glee Club ("the first piece that I took seriously") but soon settled in New York. But Carter has, as of late, been back in Boston frequently, a result of James Levine's enthusiasm for his music, enthusiasm Carter returns - he is as much a fan of Levine as his younger self was of Koussevitzky. He is still on a high from last summer's all-Carter Festival of Contemporary Music at Tanglewood. "Wasn't that extraordinary?" he marvels. "My experience has sometimes been a lot of antagonism towards my music, but now, all of a sudden, people like it," he says, adding, with a pragmatism that befits a Harvard man, "Well, maybe they don't like it, but at least they play it." And then, as afternoon nears evening, Carter cheerfully but firmly ends the interview. "You go now," he says with another grin. There are scores that need proofreading, and a new piece - a setting of poems by Ezra Pound - that requires more attention before the day is out. Another century of music is waiting.